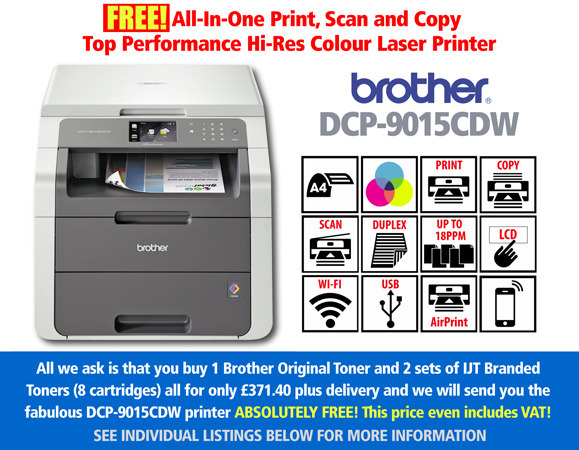 he Brother DCP 9015 CDW is the best multifunction colour laser printer on the market. Print, Scan & Copy documents easily. Use it's Duplex function, allowing you to save money on toner cartridges by printing on both sides. Print speeds up to 18ppm, wireless mobile iPrint, Apple Airprint & Google Cloudprint compatibility, make this bargain Brother DCP 9015CDW from www.ijtdirect.co.uk, the perfect printer choice. When you think ink, buy the TN245 high yield toner range and save on your cartridge cost.